This report is created using the Evaluate Energy M&A Database. 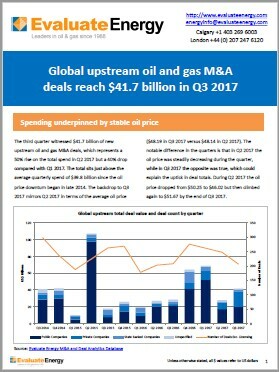 Alongside an industry overview, Evaluate Energy data and industry trends have been used to analyse all of the biggest deals around the world in Q3 2017, providing you with an extremely comprehensive overview of global upstream mergers and acquisitions that were agreed and completed in the quarter. Canada: Four big deals masking a general drop in activity?